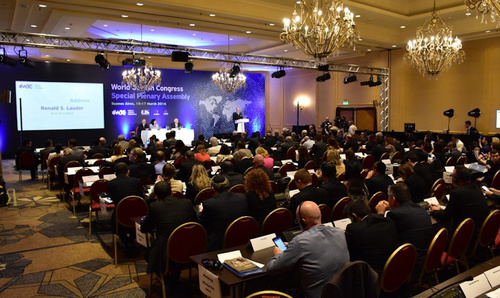 A special Plenary Assembly of the World Jewish Congress (WJC) in Buenos Aires, attended by more than 400 delegates and observers from 67 Jewish communities, on Wednesday voted unanimously to allow WJC President Ronald S. Lauder to stand for a third consecutive term as WJC president, as stipulated by the WJC’s constitution. In a keynote address to the assembly, Lauder highlighted the challenges facing the Jewish people and the State of Israel today. It was the first time the WJC held a meeting of its highest decision-making body in Latin America. Lauder declared that anti-Semitism and anti-Semites had to be confronted forcefully wherever and whenever they manifested themselves. “The Jewish people are not going to disappear. We are small in number – there a just 15 million of us around the world – but we are a brilliant and innovative people. It is the job of the World Jewish Congress to harness that brilliance." Lauder also said the WJC would fight the anti-Israel BDS movement and accused the United Nations of failing to live up to its own ideals and charter and having become a “cesspool of anti-Semitism”. He told the delegates: “We will answer the lies on the internet and in the media with the truth. Remember one important fact: We are not the Jews of the 1930s. We have influence; we have great power, we have tremendous resources, and we have creativity that is the envy of the world. I intend to use everything in our arsenal, and I will not be silent. “We will not be silent. The world will hear our voice,” Lauder ended his speech, after which he received an enthusiastic standing ovation from the delegates. The WJC considers “efforts to discriminate against and delegitimize the State of Israel on university campuses, including the boycott of Israeli scholars and academicians, to be especially pernicious,” and condemns “those who deliberately seek to prevent economic, academic, and cultural cooperation, and obstructing global and Israeli and Palestinian economic opportunities. The resolution also commends the WJC leadership for establishing a new department in the New York office to counter BDS and other forms of discrimination against the State of Israel, bringing together like-minded organizations and movements from around the world.